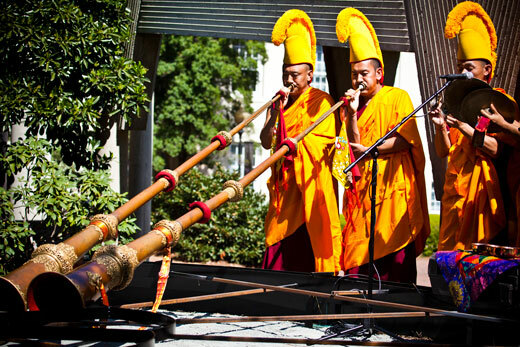 Tibet Week events began March 26 with a public ground-laying of the Living Mandala and a blessing ceremony. Emory Photo/Video. Unless otherwise noted, all events take place at the Michael C. Carlos Museum on campus, 571 S. Kilgo Circle. public ground-laying of the Living Mandala and a blessing ceremony, featuring monks from Drepung Loseling Monastery, at noon in Pitts Garden outside Cannon Chapel, 515 Kilgo Circle, Emory. public plantings for the Living Mandala take place Tuesday, March 27, noon to 2 p.m., and Wednesday, March 28, noon to 3 p.m. in the garden. A consecration ceremony is set for 6 p.m., Thursday, March 29 with the Drepung Loseling monks. Talks and panel discussions on Buddhism’s relationship to science, medicine, life and death are also planned each evening of Tibet Week. Read the related story "Living Mandala at center of Tibet Week."